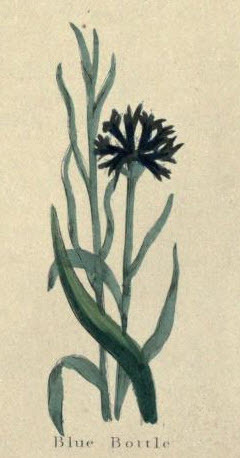 Centaurea Cyanus. It is called Cyanus from the colour of it; Hurt-sickle, because it turns the edge of the sickles that reap the corn; Blue-blow, Corn-flower, and Blue-bottle. Its narrow leaves spread on the ground, being of a whitish green colour, amongst which rises a stalk divided into divers branches, with long leaves of a greenish colour, a little indented; the flowers are of a blue colour, consisting of many small flowers set in a scaly head, like those of knapweed. The seed is smooth, bright and shining, wrapped up in a woolly mantle. They grow in corn-fields generally; towards the full of the moon, they will grow more double than they are, and many times change colour. They flower from the beginning of May to the end of harvest. The powder or dried leaves of the Blue-bottle are given with good success to those that are bruised by a fall, or have broken a vein inwardly, and void much blood at the mouth. The herb is a valuable styptic, and exceeds all other things, and may save a life when surgical aid is not available. The leaves fresh gathered and bruised will stop the bleeding of a fresh wound, even if a large vessel be cut. An infusion of them works gently by urine. The leaves or seed taken in wine, is very good against all infectious diseases, and pestilential fevers. The juice put into fresh or green wounds, rapidly heals them, and it is very effectual to heal all ulcers and sores in the mouth, the juice dropped into the eyes takes away inflammation, and the distilled water of this herb has the same virtues.